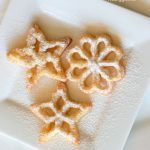 Rosette Cookies are a Scandinavian Cookie that is similar in texture to a funnel cake. One of my most favorite cookies during the holidays are rosette cookies. They are light, sweet and crispy. They remind me of my Grandma and her big cookie platter that she’d pull out on Christmas Eve. These cookies were always the first cookies to go. You probably have all the ingredients in your kitchen right now to make these. For the equipment, you will need rosette cookie irons to make them. You can find them on Amazon. Whisk together eggs, granulated sugar, milk, and vanilla in a large bowl, then add flour and salt, whisking, until just combined (do not overmix, or cookies will blister). Heat oil in a 3- to 4-quart heavy saucepan with rosette iron in it until thermometer registers 370 to 375°F. Carefully lift out iron, letting oil drip back into the pan. Dip all but top edge of iron into batter 3 seconds, then submerge iron into the hot oil and fry (batter adhering to iron) until golden, 35 to 40 seconds (do not let go of iron; cookie will shatter if it hits bottom of saucepan). Lift the iron out, letting oil drip off, and, working over paper towels, carefully pry off rosette cookie with a fork. Let rosette drain, hollow side down on paper towels, then make more rosettes in this same manner, heating iron in the oil 10 seconds before dipping it into the batter each time. 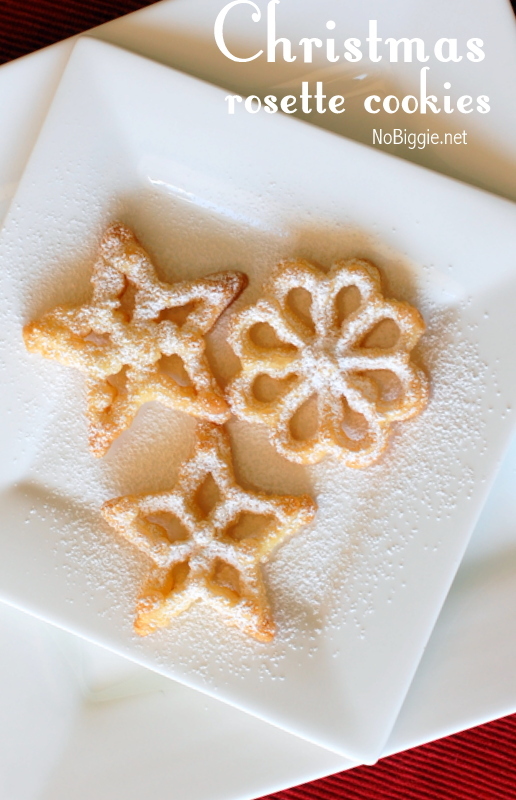 Dust rosettes with confectioners sugar before serving. - Use a thermometer specifically made for the high oil temperatures. A deep fry thermometer that can remain in the oil works best, so you can continually monitor the temperature and adjust as needed. - Use oil that will withstand the high temperature for prolonged periods of time, such as canola or peanut oils. - Season the irons before using for the first time by keeping them dipped in the 350°F oil for about 15 minutes before you begin. 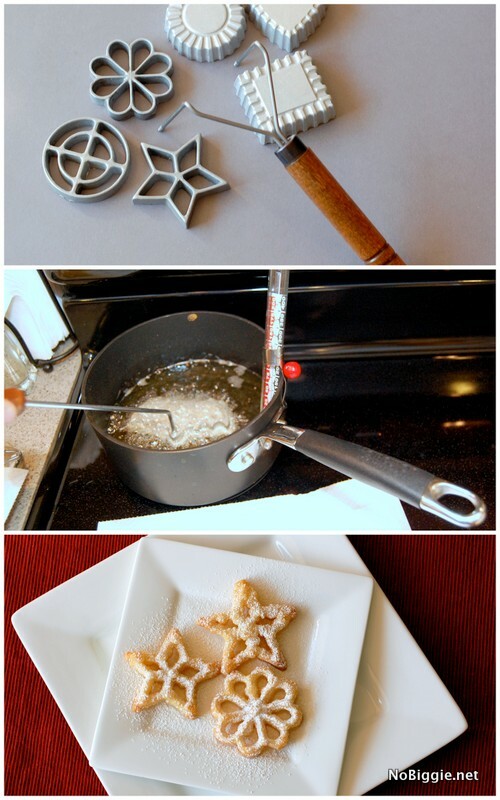 - To make crispier rosettes, cover and refrigerate the batter at least 2 hours before using. - Important: Do not cover entire mold with batter, or the cookie will get stuck on the mold. Only allow the batter to cover 3/4 of the way up the mold. - If excess batter adheres to the top of the mold, use a knife to remove the excess, then cook as usual. - If the batter does not adhere to the mold, check the temperature of the oil. For best results, keep the oil at 365°F. - Rosettes can be stored in airtight containers for weeks. They also can be frozen, ready for any occasion. If needed, re-crisp in minutes in a 300°F oven. These cookies freeze really well too. - When you begin to dip, the temperature of the oil needs to stay at the right temp and the irons have to be hot from the oil each time you dip it into the batter. Use a thermometer specifically made for the high oil temperatures. A deep fry thermometer that can remain in the oil works best, so you can continually monitor the temperature and adjust as needed. Season the irons before using for the first time by keeping them dipped in the 350°F oil for about 15 minutes before you begin. Rosettes can be stored in airtight containers for weeks. They also can be frozen, ready for any occasion. If needed, re-crisp in minutes in a 300°F oven. When you begin to dip, the temperature of the oil needs to stay at the right temp and the irons have to be hot from the oil each time you dip it into the batter. I’d love to know, have you had or made Rosettes before? We made some rosette cookies for Halloween too. My mother-in-law and all her sisters started the tradition of making rosettes for all the family weddings. We get together and make hundreds at a time. I am the decorator not the frier. We decorate them using a thin frosting and dipping the open side in the frosting then dipping in a colored sugar. I’ve only fried a few but I know that we usually take them off the iron while still in the oil. A quick tap on the top of the iron and they should come right off if the oil is the right temp. Looking at your pictures is making me hungry for some right now! I thought of funnel cakes as soon as I saw the photo, and then I saw that you mentioned them! What a fun and different twist on a Christmas cookie! Yes! You’ll have to try them! Thanks Erin! I’ve never made them – but they used to be one of my favorite xmas treats – my god-mothers mother used to make them… oh they were so good! I made rosettes for the first time this year. We always had these growing up at my Aunt’s home along with krumkake. They look like little ice cream cones and taste yummy too. Thanks for all your great ideas and recipes. Merry Christmas. Krukake! Yes!! We love all the old Scandinavian treat traditions! So fun! Thanks for your sweet comment! Merry Christmas! I have never madde rosettes before and not sure that I’ve ever even had them. I do have a set of rosette irons though that my husband’s grandmother gave us a few years ago. I need to try making them sometime soon. You should! They’re so good and it will be fun to remember an old favorite. Merry Christmas! My mom always made these before Christmas and sent some to my father’s work saving the rest for bridge night. One thing she did differently was to dip the edges of some in granulated sugar – it gave them a different look, kind of sparkly/frosty where the ones with the powdered sugar looked like they were snow dusted. Both were very nummy! Okay, your mom sounds just like me sweet Grandma with the bridge playing and sending them with her husband. We do the granulated sugar too. Love them that way too. Thanks for sharing! These look soooo good! I’d so love one right now. I’m a new follower on Google+ & bloglovin. Thanks so much for sharing! Here in Hawaii they are called “Chinese pretzels” and are very popular all year round. They are usually not dipped in sugar, but eaten plain. I have a collection of many molds, some heavy cast iron ones over fifty years old. Guess I’ll drag them out and make some for Cristmas. My grandpa from Sweden made these one Christmas he visited at Christmas time when I was a little girl. This is th e 2nd year I’ve made them with my kids, thank you for this instructional post! I love coloring them with food color then dipping them in cinnamon sugar, yum and pretty! add on pieces? Would appreciate any info on that. I found some at world market. I have my Mormor’s rosette irons! I need to make these – it’s been a very long time since they’ve been put to use. I just ordered some rosette irons after reading this! I used to get them all the time at the local farmers market in my home town when I was growing up. I have been wanting to get the irons for years…you just gave me the impetus! Thanx! these are Sugar Waffles. my Mom made sugar waffles in the 1980’s same process as your “cookies”and sure enough i recognize your circle “rosette cookie” image that was my mom’s regular Sugar waffle shape. from the iron she had. they were light and very delicious, and she put powdered sugar on them also that is what you were to do back then. okay going to be dumb I guess but the irons you use to make them with looks like the batter will fall out of the bottom ? If the oil is hot enough, the batter sticks to the iron and just crisps up on the iron. It starts to pull away when it is done. I have not had these since I was a little girl. My mom would make these for my two brothers and I when we were living in Lancaster, New York. And when dad and mom had a garage sale. We called these sugar waffles. Our mom still has her irons that she made these back in the 1980’s . I am very glad I found these here. A set of my own irons. Whole milk messes my husbands stomach up. So i get 2% milk when I go to the store.